Here are some pictures from our very enjoyable Christmas concert, as performed by our senior classes. It was a great way to get the parish in the Christmas spirit! And here are some of the pictures from our Christmas Nativity play as performed by our junior classes, which was equally as enjoyable! On the 5th of December the pupils from 2nd to 6th class travelled to Citywest Conference Centre to perform in the Young Voices concert with a choir of one thousand children from all over Ireland. Preparations for this concert began way back in September and the children have worked diligently to learn the melody of the songs along with all the lyrics. For some songs the children even had choreography to learn. After three months the big day finally arrived and the children headed off to Dublin early on Thursday. On arrival they were allocated their seats in block E and had enough time for a bite to eat before the rehearsal began with the live band and guest performers. The guest artists included Connie Talbot from Britians Got Talent After the rehearsal there was an hour long break and once the audience had taken their seats the concert began. The children sung and danced their socks off all night long. 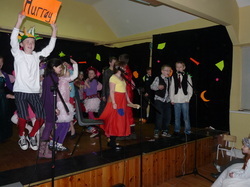 The school put on a sucsessful show in the parish hall on the 20th of December 2012. 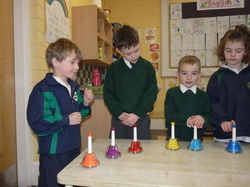 The above picture shows the infant to 2nd class play which was called The Wriggley Nativity. The side picture displays a scene from the 3rd to 6th class play - Cinderella and Rockerfella which was a side splitting pantamine. In fact anybody who attended the show commented that they were blown away by the children's fantastic performances.The night concluded with the whole school performing some enjoyable Christmas songs. In all classes we love to create and experiment - have a look at some of our work !! We all enjoy music in Seir Kierans National School. From singing as a class or whole school to experimenting with instruments to create our own music. Recently we received a donation from the parish choir from which we bought a set of colour coded handbells. They are so much fun to use. We are really greatful to the choir for thinking of us and kindly enabling us to purchase this resource.